Bullet Journalling is a modern-invented productivity powerhouse. Touted as ‘the analog system for the digital age‘, this brainchild of Ryder Carroll hit the internet in 2013, and has become a foundation stone of organisational strategies for the modern day. The #bulletjournal instagram hashtag has over 100,000 posts, and you can bury yourself in beautiful Pinterest images of creative bullet journals from all over the world. I’ve been using the Erin Condren Life Planner for the last few months, and really not felt it working for me. While there are a lot of things I do love about it, I just was generally looking for something very different. There’s a whole post in my thoughts on the Life Planner, that I’ll share another time – but after some going back and forth, and debating what I wanted to do (that Life Planner was not cheap, and I was having a lot of guilt around switching) I thought it was time to give the bullet journal another go. There is an amazing introduction to bullet journalling via the website that is definitely worth a read. My take on it is that bullet journalling is setting up a notebook to be whatever you need – a compilation of a calendar, diary, daily to-dos, dreams, goals, and capturing all that information inside your head down all in to one spot. 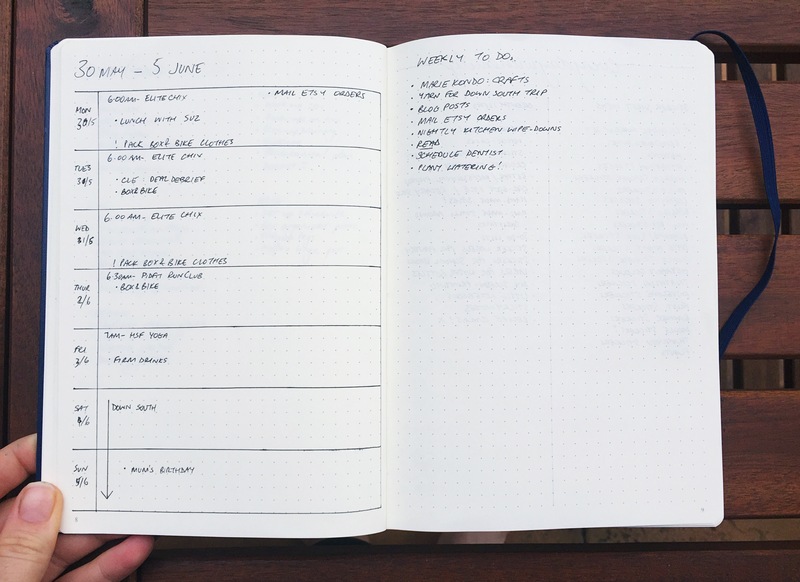 I’d tried the system in 2014, and really loved it, but fell back into using the layout as a written journal rather than a planner, due primarily to my life and job at the time. I’d unintentionally used a similar method when writing my honours thesis – I had a simple notebook, and started a fresh page for each daily to do list, which really functioned as a brain dump of everything in my head – tracking how much water I drank each day, what tasks I needed to do for my thesis, random things I wanted to do when uni was over…any thought that floated through my mind so that I could focus on my work rather than get distracted by what was floating past. The bullet journal functions in a similar way. It is premised upon rapid-logging – getting your thoughts on paper and out of your head, in a simple and easy to read, easy to access and easy to understand format. I spent a peaceful Sunday setting up my bullet journal. It felt like the right time to kickstart my new bullet journal in June, when I turn 26 and begin tracking my 27th year on this earth (I swear I’m still 20…??). I also feel that I have more of a handle on what my life looks like, and what I want out of it – so I’m not jumping back and forth between planning systems and projects and ideas. I know what I want to record, and what I want to remember. All you need to get started is a notebook (any notebook), and a pen. I began by going out and buying myself a Leuchtterm A5 dot-grid journal. I used a Leuchtterm last time I tried the bullet journal, and fell in love with the beautiful paper and design, the quality covers and the page numbering (which becomes very convenient). I have used Leuchtterms for general journalling (I’m on my third, and love how they all look stacked together!) and use one for on and off lists at work, which I find to be way more convenient when all in one place. I have Leuchtterms in blank, grid and lined. I find the grid and lined a bit too definitive, and they generally end up quite messy. I tend to favour blank pages for general journalling, and was going for that option, but after a heavy stalk of the beautiful instagram feed of @bujo.auslife , I figured the dot-grid was the perfect balance of providing some neatness and structure, while leaving space for some creativity in lettering. I used the first page of my bullet journal to capture one of my favourite life quotes by Thoreaux. It felt like an appropriate choice to kick off the start of a new year of my life, and a new organisational method. I googled around for some inspiration for setting up for the month. I have borrowed very heavily from the @bujo.auslife instagram, and from the traditional bullet journal method. I started with a two-page spread setting out a monthly log and a habit tracker. A monthly log functions as a month overview. 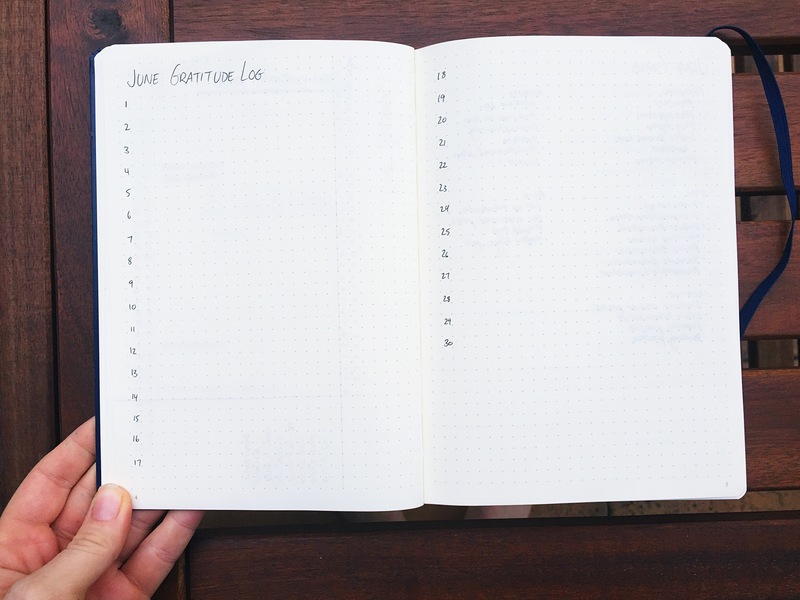 I’ve seen lots of bullet journals that prefer to draw up or stick in a traditional month calendar with boxes for this page, but the list-lover in me was drawn to this simple list style. I love that it captures just the big key events for that month in one place. I left a column to the side to include little signifiers, so that I can easily see important events or birthdays. Officially the monthly log is a two page spread, where the left side is the log as pictured above, and the right side is a monthly task list. I prefer to set monthly ‘goals’, and think of my tasks on a weekly basis, so I skipped the tasks page. 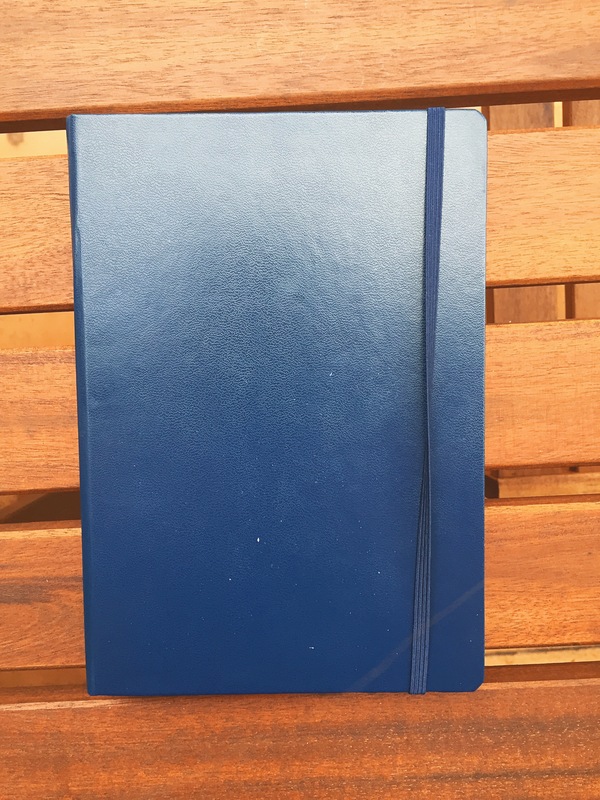 But the best thing about bullet journals is that this is totally allowed – unlike a pre-printed diary or planner where you’re beholden to what’s on the pages before you. The habit tracker is something I’ve seen across instagram accounts, and I just love the concept. I had a 108-day duolingo streak going (I was heartbroken when I missed a day! ), and loved how it tracked the fact I did my lesson everyday in the app. 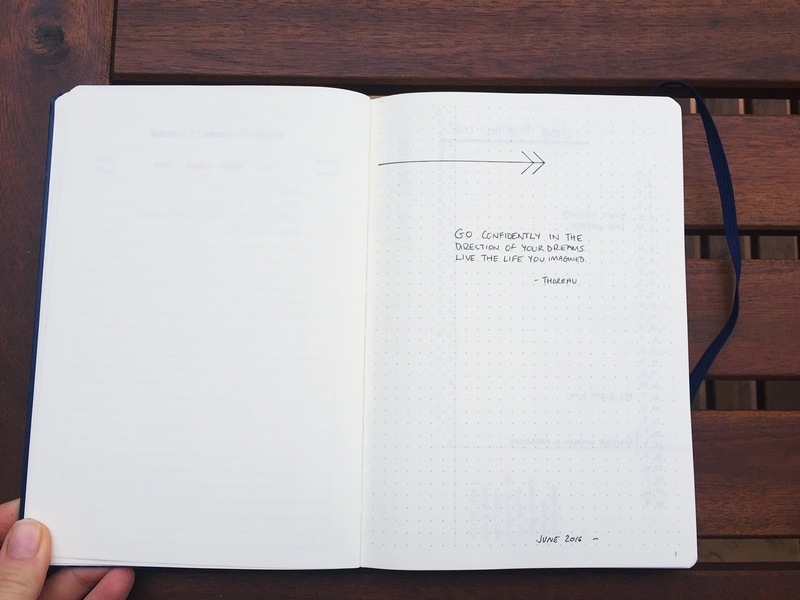 This habit tracker provides an avenue for doing the same thing within the bullet journal, but all types of goals. I’ve listed my various exercise and gym options, drinking 2L of water a day, meditating, duolingo and reading for now, with room to add more habits that I want to work on as they occur to me. I’ve seen different people record days they completed their tasks in different ways – colouring in the boxes in different ways, or putting in dots. I plan on doing dots, because the minimalist style is really appealing to me lately. Next I included a gratitude log. There is so much information out there about the benefits of introducing a practice or habit of gratitude into your life. All science and questions aside, there’s no doubt that taking time to appreciate the little things only breeds gratefulness and greatness in your life. I’m planning on taking a minute at the end of each day to populate this log before I go to sleep, so I go to sleep happy, rather than pondering the long list of work or activities I have to do the following day. I debated a little about what to draw up next. I chose a weekly spread to capture general events happening on each day, including exercise classes and lunch and dinner plans, and any major to-dos that I knew were coming up in the left-hand table. On the right, I started jotting down some general weekly tasks. This spread will definitely evolve as I continue to trial this system, which is why I’ve left it extremely simple. I do think I’ll end up doing daily to-dos as well – as a chronic list-maker, I can always find something to list down and cross off! But I’m really happy with the pages I’ve chosen as my starting set-up. One of the best parts of bullet journalling is the concept of collections. I can’t see anything about collections on the official site, but the collections pages are some of my favourite to browse on instagram. They really function as a themed brain-dump – capturing lists of books to read or that you have read, addresses, ideas, dreams, memories…anything that is swirling around your brain, make a collection! I already started three – a list of future ideas for my etsy store, blog post ideas (which I used to just jot down in random notes on my iphone), the list of addresses for my penpals and books I want to read. I definitely see my collections growing overtime as my bullet journal evolves. The magic of the Leuchtterm notebook comes with the pre-numbered pages and index. 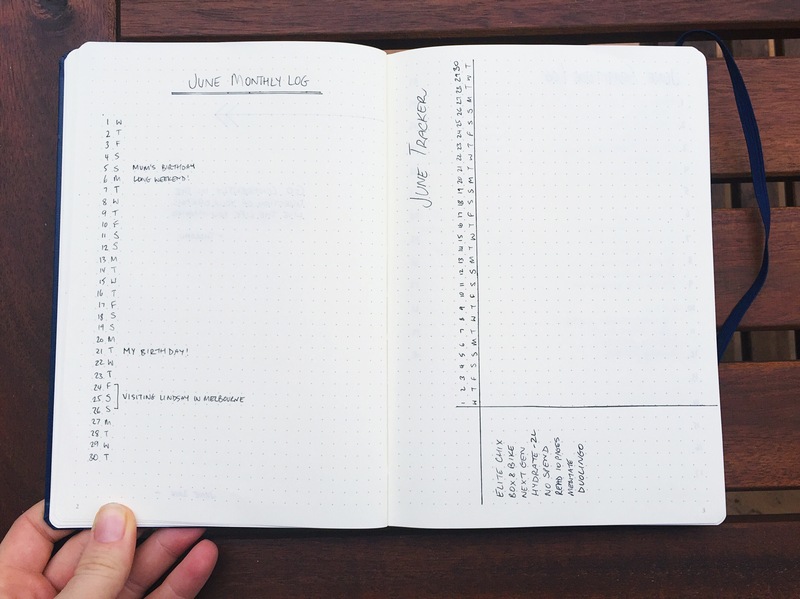 As the bullet journal functions as an all-in-one place to capture your lists, your calendar, your tasks and your future plans, having a functional index allows you to quickly keep track of where you’ve stored different information – your monthly logs vs all the ideas you had for your friend’s hen’s party, for example. Having an index also allows you to effectively ‘thread’ pages – rather than trying to save a few pages to dedicate to a particular project, like I normally would to track all of my etsy store ideas, stats and information, you can record in the index that you put your ideas on pages 2, 7 and 19, and record that information in the bottom right-hand corner of your pages. In case it isn’t obvious, I’m extremely excited about this system, and I’m really looking forward to putting it to the test. I found myself putting information all over the place – a planner to track my food and exercise, a planner to write lists in, a planner as a calendar, a notebook for work plus a list pad, and it was just all getting a bit much. I never had the right book with me at any particular time to capture what I wanted to, and there was so much information sprawled all over the place so that this complicated organisational system was riddled with inefficiencies. As a result, this streamlined approach really excites me, and I hope to report back at the end of the month still full of enthusiasm. If you’re thinking of trialling bullet journalling, I definitely recommend reading the official site. Other great resources that I used when deciding how to set up my notebook are Boho Berry and Tiny Ray of Sunshine. If you do check out those links, I highly recommend making a cup of tea and settling in for a good long read – there is so much beautiful inspiration on those blogs that you won’t be able to tear yourself away. Lastly, check out the #bulletjournal and #bujo hastags on instagram. However, tread lightly when you delve into an instagram vortex. It is easy to get overwhelmed by how creative and beautiful (and neat!) some people are with their bullet journals, which is why I referred to @bujo.auslife before – remember that your bullet journal is yours and yours only. If you want to make it beautiful with stickers and washi and coloured pens and doodles, don’t hold back! But at the same time, the journal still works, whether or not you spend hours drawing beautiful things, or simply jot down the tasks and events that make up your day. I’m definitely a sucker for comparison, so I had to be firm with myself when setting up my journal that I only needed to include what mattered to me, and it didn’t have to be beautiful (which is fortunate, since I’m a terrible drawer). I’ll still be maintaining (read, using up!) a journal for more long-form recording of my thoughts, primarily because that’s usually an extremely messy brain dump of whatever emotional mess I’m in at the time, and I like to keep that part of my brain and life separate from a place where I capture events, activities and goals related to work, life, this blog and etsy, which I think is definitely the system that works for me. 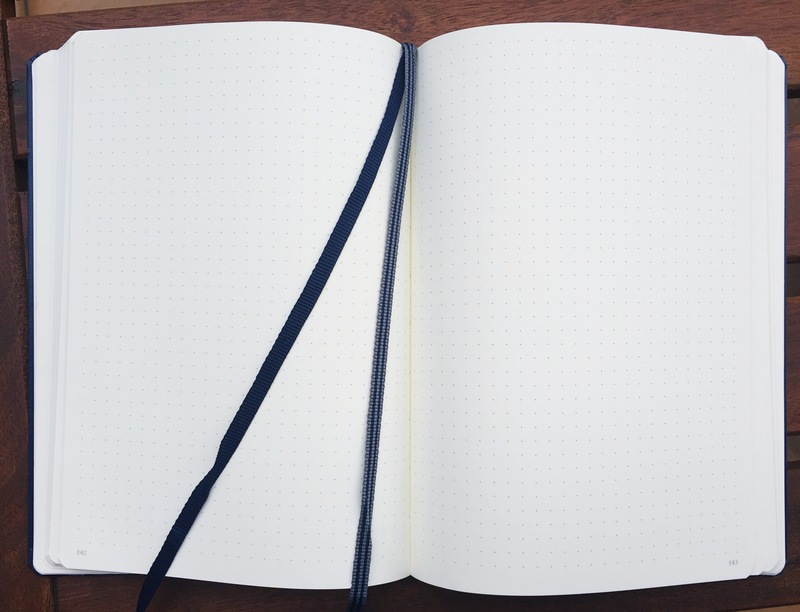 But the best part about the bullet journal is that since it is, in the end, a blank notebook, you can just allow it to grow and transform as you need. Have you tried bullet journalling? Do you have any tips or tricks to share? Let me know in the comments! I’m still in shock. I’m not entirely sure I’ve ever said no to anything in my entire life. Years of being told to say yes to every opportunity presented my way turned it into a solidified habit. And it was a habit that I used to define myself. Taking opportunities brought me a sense of happiness, especially those opportunities that presented them self in an unsolicited manner. But taking all those opportunities also brought some serious emotional exhaustion. I have been a perpetual roller coaster, the thrill of having a new project and focus, the confusion about what to do, the sense of purpose, then overwhelming hopelessness, excitement and belonging, typically culminating in crying in a bottomless pit of despair when I’d taken on way too much – only to finish and forget all about that when the next yes escaped from me. This compulsion to agree has managed to cloud what I really believe in and what I’m passionate about – I let my interests and passions be dictated by whatever opportunity turned up on my door. And then suddenly, I was asked to take on the kind of project that only a year ago I would have leapt on – an opportunity to run a huge event, to be part of something, to be completely consumed with a group of people by a singular focus. And immediately I just knew the answer was no. I was so confused by this response that I obviously had to discuss it at length with the boyf – who was patient for a while, but was definitely over the subject before I was (I do have an amazing capacity to talk about me for an extended period of time). But the saying ‘if it’s not a hell yeah it’s a no’ was at the forefront of my mind. And it took me 24 hours to come to terms with it. But I did it. I said no. It’s an exhilarating and I feel so free. I’ve slowly been refining my interests and passions, and this no was another step in the right direction in coming up with a core definition of what I believe in. End preach. But I’d love to hear if you’ve experienced a similar sense of defining your purpose through saying no in the comments. It’s been a while since I got to review one of these bad boys! I’ve been really looking forward to getting the Goodness Me box. I’ve known about it for a while, but was waiting for an elusive discount code so that I could sustain the expensive habit of subscription boxes. Around Easter there was 30% off a 3 month membership, so I swooped on the opportunity, and received my first box in April. The Box: Goodness Me Box, a box designed to encourage health food sampling, providing a box of 5 – 10 samples a month with the goal of getting consumers excited about eating pure and wholesome food. Cost: Monthly subscription is $25/month with free shipping. There is also a 3 month subscription for $70 (upfront), a 6 month subscription for $135 (upfront) or an annual subscription of $265 (upfront). Delivery time: I can’t report on this one, as somewhat irritatingly I didn’t get an email notification letting me know my box had been shipped. As usual I got my box delivered to work (I think I’m really starting to test the patience of the service centre), and was very excited to have it arrive. This box comes in one of those nicely packaged foldy boxes with themed tape, wrapped with twine and a little Goodness Me tag. There was a bonus Soma Bite bar in the big packaging, which actually came across kind of random. I found myself questioning whether it was supposed to be in the box and they just forgot? It was an odd packaging decision. Inside the box, the items were wrapped in tissue paper, and the box was stuffed with filling paper, which made everything present really well immediately upon opening. The information booklet that came with the box contained the name of the product, some info about the brand and the cost of the item. however, those numbers were a little off, and I’ve calculated the above value based on the actual weight of the products received. Disappointingly, the total value of the box only met the cost of purchasing it. Chai tea: delicious. I always find organic brands of tea have a better aroma than, say, Twinings. Whether that can be attributed to the organic-ness, or just they put more effort into packing a punch with the herbs and spices they use, I can’t say, but I would buy these in a store. Just Jerky: actually amazing. The honey and coriander flavour was subtle but delicious, and the jerky bites were a great size. Jerky is never something I would contemplate buying, but if I had it in my cupboard I would probably never stop eating it. Definite 10/10. And consistently with the Goodness Me brand, the jerky is sustainable sourced and ethically produced. So that’s nice. Soma Bites bar: hard no. Weird flavours and texture. Definitely would not re-purchase. Fruit-Free Bar: very delicious. I detest dried fruit and any kind of fruit bar, because I subscribe to the belief that if you aren’t actually holding the fruit itself in your hands (e.g. an actual apple) you aren’t eating it. You’re just eating a sugar version of it. I’m not open to being disabused of this notion, not matter how much it appears based on rubbish, but of course you don’t have to agree with me. However these don’t feel particularly healthy to eat, since it is all packaged and stuck together and generally feels a bit fake, so I wouldn’t be substituting plain nuts for this bar on a regular basis. Although this box was full of great and different products, the fact the value of the box didn’t greatly exceed the cost of subscribing really turned me off. Next month’s box has been advertised as ‘Decadent Desserts’, so I’m hoping that it will meet the quality of the goods in this box, and exceed the value!